WRGN Friends are a group of supporters that form the backbone of WRGN's volunteer team. They are involved in the WRGN Annual Yard Sale, WRGN Sharathon, Mission Possible and WRGN monthly mailings	and much more. The monthly meeting of the WRGN Friends is critical. It is how the Friends stay connected and plugged in with each other and the ministry of WRGN. They receive the inside scoop of how God is working with WRGN. To participate in the Friends of WRGN, simply come to the next meeting. If you need any more information, call us at 1-800-245-3688. Or simply click on the "Contact" link at the top of this page, and fill out the form, requesting more information. 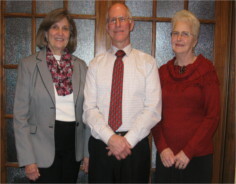 Bev Sorber (Secretary), Randy Parry (President) & Barb Saxe (Vice President) of the WRGN Friends group.